A Great Chapter in Italian History. The green soul of technology. 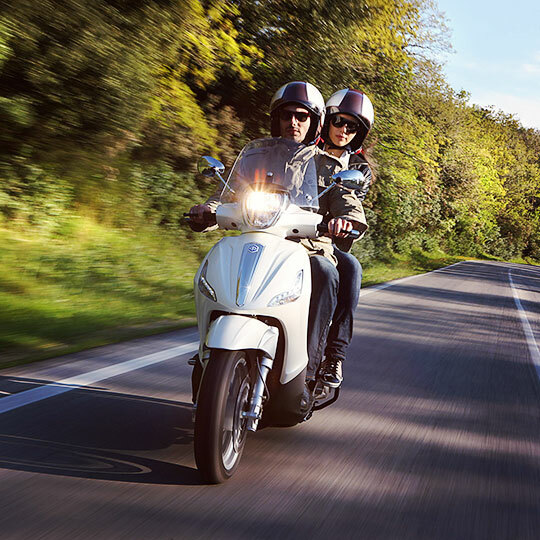 The Piaggio Group has designed a revolutionary new hybrid technology that combines a conventional internal combustion engine with low environmental impact with a zero-emission electric motor. These two souls - one run one electricity, as the ultimate safeguard for the environment, and the other on gasoline, to guarantee autonomy on unusually long journeys - coexist synergistically, for safe, easy, cheap and fun driving. The innovative Piaggio Multimedia Platform (PMP) is based on BlueDash technology, which, by connecting the vehicle to the iPhone, provides the rider with a sophisticated and multi-functional on-board computer. The wireless connection enables a set of fundamental performance indicators to be displayed on the smartphone's touch screen, so that the rider can keep a vigil eye on various vehicle parameters. Thus, information concerning speed, RPM, power output, torque, lean angle, longitudinal acceleration, instant and average fuel consumption, average speed and battery voltage is always available to the rider. Piaggio's latest generation 3-valve engines improve performance while reducing fuel consumption and pollutant emissions. This innovative air-cooled 4-stroke single-cylinder engine, with a 3-valve (one exhaust and two intake) single overhead camshaft and electronic fuel injection, was designed and built at the Piaggio Pontedera plant, one of the most advanced R&D centres in the world.Performance, quietness, smoothness and fluidity of movement are all improved. The result? Modern, environmentally-friendly mobility, and unparalleled driving pleasure.